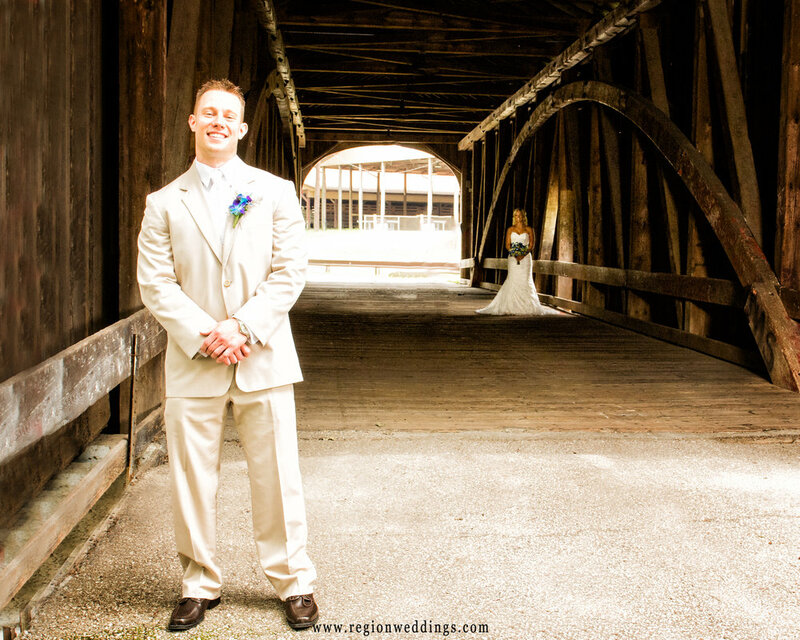 First look under the old covered bridge at Lake County Fairgrounds. Okay, so these couples aren't celebrities, but I'm calling them "famous first looks" anyway!! The purpose of today's post is to show you some of the many "first looks" or "reveals" that I've done over the years and why I think they are important. Breaking with certain wedding traditions are difficult to do. Your mom had a totally different wedding in a different era with different styles. To her, this whole "reveal" thing will probably be very foreign. Back then wedding photography didn't have different locations with creative, magazine style imagery. It was "look at the camera and smile" and that may have been it. You may have friends who have warned about superstitions they have heard about or seen on wedding websites, etc. While I will definitely respect your wishes, keep an open mind about doing a first look and taking some of the stress out of your big day. An emotional first look of the bride and groom at Holy Spirit Church before the ceremony. I have shot countless numbers of weddings where the bride and groom have not seen each other before the ceremony and we have found time to make beautiful images for them. However, that sometimes requires a lot of discipline from family, wedding party and the bride and groom themselves on wedding day. This is especially an issue if you are having a ceremony that is close in time to the start of your reception. In an early afternoon wedding for example, there is usually no need as we have plenty of time for family photos, wedding party and couple's shots. Ceremonies in the 5pm range means very little time for post ceremony congratulations, family pictures, wedding party and bride and groom. Within no time you are required to be at the reception for introductions. At church ceremonies, often another event is occurring right afterwards that restricts time even more so. Late Fall, winter weddings as well as early Spring weddings often see night come in the late afternoon. I can shoot terrific wedding photos at night for you, but is this the look you want? If beautiful Autumn color is what you are going for, consider an earlier ceremony or a first look. On paper it may even look like you have plenty of time, but from experience I can tell you that you will be in a constant state of "celebrity" on your wedding day. Your friends and family want to wish you well and you will want to accommodate them and give them some of your time. It's tough to get away, especially after the ceremony. i do work very quickly, but gathering family for pictures does takes time. First look overlooking farmland at the couple's home. Father of the bride delivers his daughter to the groom on the Centennial Park bridge. So how does all of this work? Often times we have the groom meet the second photographer at a pre-determined location and then the bride arrives to find him facing away. Sometimes we even put a twist on it like in the shot above with the father of the bride delivering his daughter across the bridge. I often choose a location with a bit of room as I like to focus back and forth from the bride to the groom and back, capturing the emotions and excitement. These reveals have the added benefit of real, non-staged moments. These are often very cherished images in the wedding book. The image below is the summer wedding and reveal for Wendy and Kelly at Lighthouse Restaurant. 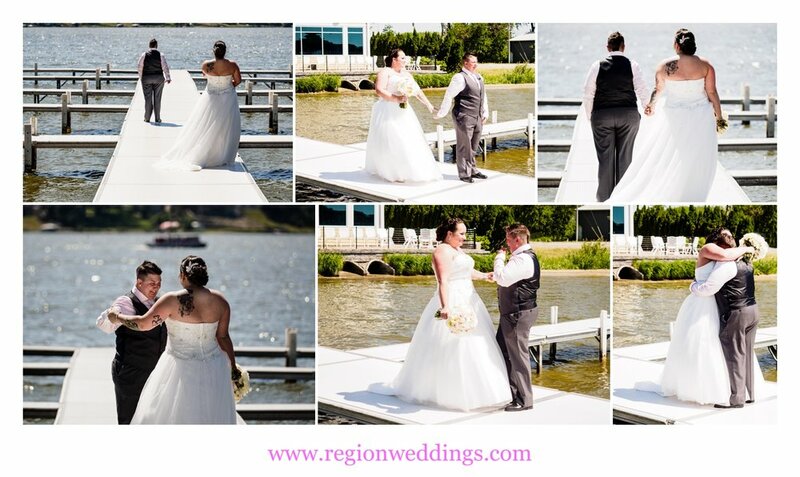 First look for the soon to be Mrs. and Mrs. on the pier of Lighthouse Restaurant in Cedar Lake, Indiana. Not convinced? That's okay, I will come up with a plan for you. If you want to see each other for the first time when walking down the aisle, here is what I suggest. Have your partner's side of the family meet me or my second photographer at the ceremony site about one hour before everything begins. We will take their solo and wedding party pictures and their family at this time. The reveal at Lemon Lake Park. So there you have it, "famous first looks" from this past year as well as from the archives. I always like to give my client's real world advice about their wedding day. I don't want you to look back and think "wow, the photos are great, but what a chore they were to get". I don't want to convince you to go against your principles either. So, no matter how you choose to plan your day, let's work together to make it a great experience and get you those great images - candid moments, important family photos and also art to hang on the wall of your new home. Be sure to fill out the Contact Form if you have any questions.